You can use an upstream registration proxy if your ISP requires it. 1. Go to System > Preferences > Registration options. • Server – Enter the hostname or IP address of the proxy server. • Port – Enter the port number to use. • Username – Enter the username provided by your ISP. • Password – Enter the password provided by your ISP. Note: The upstream proxy has no bearing on the Smoothwall proxy services. Additionally, the Smoothwall provides detailed information back to Smoothwall about the status of your system and web filtering statistic. Note: Smoothwall takes every available measure to ensure data cannot be associated with your organization, and no personal information is ever sent. Usernames and passwords, and sensitive information are not sent. Any potentially identifying information is summarized and anonymized before sending. By default, extended statistical information is sent to Smoothwall. 2. 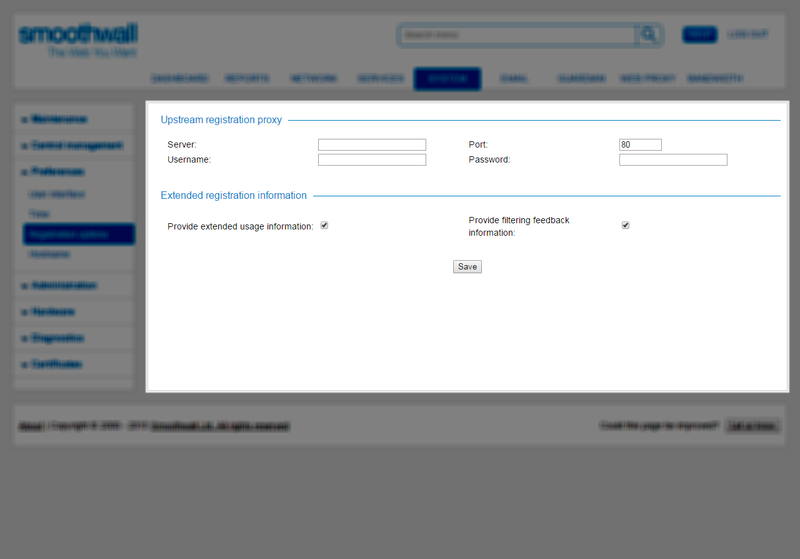 To stop sending registration information, clear the selection for Extended registration information. 3. To stop sending web filter feedback, clear the selection for Provide filtering feedback information.